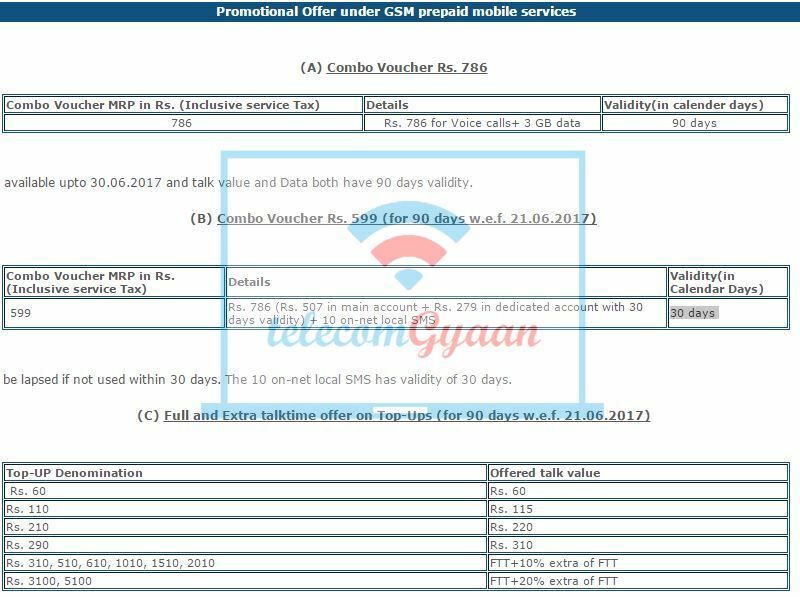 Bharat Sanchar Nigam Limited (BSNL) has introduced 2 New Combo Vouchers offering Data & Talk Time. Also BSNL has introduced few Full & Extra Talk Time Vouchers from 21st June till 30th June only. Starting with Combo Voucher 786, BSNL is offering Rs. 786 as talk time and 3 GB data. The validity of both data & talk time would be 90 days from the date of recharge. This promotional Combo Voucher 786 is available till 30th June, 2017 only. The Combo Voucher 599 offers talk time of Rs. 786 divided as Rs. 507 in main account (unlimited validity) and Rs. 279 in promo talk time dedicated account having a validity of 30 days only. This Combo Voucher 599 is available starting 21st June 2017 for next 90 days. Lastly, BSNL has announced few Extra & Full Talk Time Voucher offering Full Talk Time for as low as Rs. 60. These Extra & Full Talk Time Voucher are also available starting today (21st June, 2017) till 30th June, 2017 only.